Think competitive rivalry during the World Cup is confined to the pitch? Think again. With the World Cup being one of the most reported events in the media and a global platform for fans, it’s no surprise that each year, brands pull out all the stops to leverage the event and connect with existing and potential consumers. As this year’s World Cup is no different, we take a look at who’s winning the battle of the brands with their current campaigns and share some tips to help you with your own content marketing strategy. The two largest sportswear brands go head to head with Nike striking first. Its #riskeverything campaign produced several hugely successful videos including the entertaining ‘Winner Stays’ and The ‘The Last Game.’ The films feature Nike affiliated players including Ronaldo, Rooney and Neymar doing what they do best. 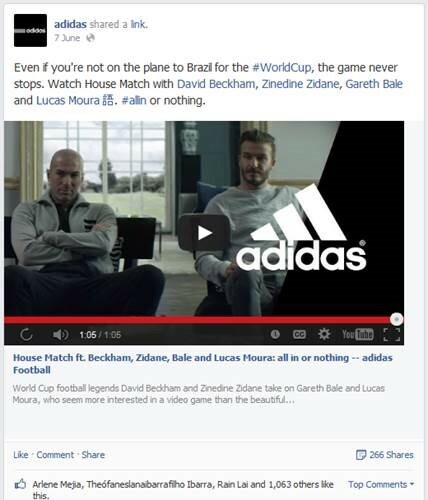 Trying to stay on a level playing field (sorry…), official World Cup sponsor, Adidas released a video called ‘House match’ in which Beckham, Zidane, Bale and Noura play a football match indoors. 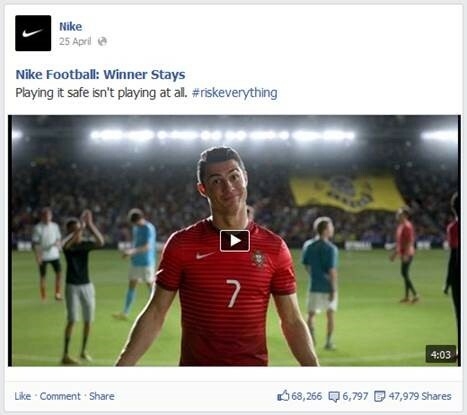 Nike’s #riskeverything campaign proves the risk was worth taking as its ‘Winner Stays’ video has 79 million YouTube views compared to House Match’s 16 million. Despite not being an official sponsor and therefore not having branding all over the games, Nike is reigning over Adidas (and all the other official sponsors) in terms of social buzz and brand mentions. This is the perfect example of content that people feel compelled to share. There’s a valuable lesson here – Nike wins by playing it different. The company is able to imply official status through content creation. So the next time you’re thinking of taking a calculated risk against a direct competitor, just do it. When it comes to football, instant reaction and huge uproar comes with the territory. 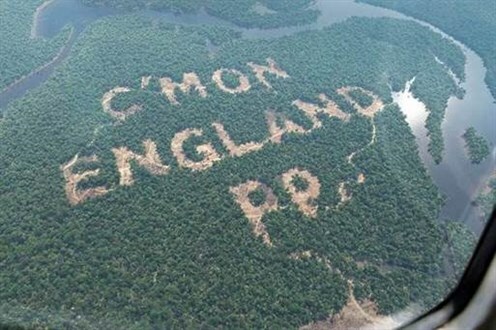 In a controversial move, Paddy Power carved “C’mon England” in the Amazon rainforest ahead of the tournament. Needless to say, the brand began trending on Twitter and received some serious abuse. An unfazed Paddy Power replied to those with the largest Twitter following with messages like “don’t get your hemp knickers in a twist” and “we didn’t burn that much”. Shocked and appalled? So were the masses until it was revealed that it was a hoax! The stunt was in fact to raise awareness about deforestation of the rainforest. 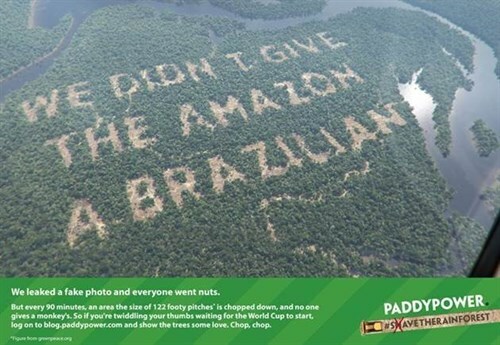 Both Paddy Power and #SaveTheRainforest started trending on Twitter as abuse turned to laughs and even some praise. Over 160,000 people visited their blog in 24 hours where PP explained the stunt and the reasoning behind it. Did the stunt pay off? Without having a budget as grand as let’s say, Nike’s, this simple but effective piece of content marketing gained huge social coverage, and was picked up by lots of online news sites (read more here). Being controversial isn’t necessarily a bad thing. Paddy Power have proved that a bit of creative controversy can reap rewards in terms of buzz, coverage and links, with Twitter proving the perfect arena. 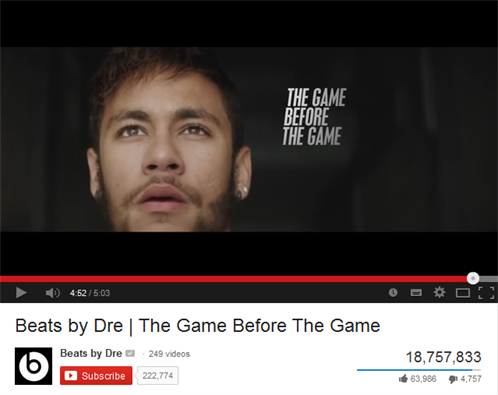 Recently bought by Apple, Beats certainly struck a chord with its fans with its ‘The Game Before The Game’ advert which went viral. It features footballers, celebrities, and other key leading figures in sports to showcase the psychological preparation that goes on before a game. Extremely. Within just two months of being uploaded to YouTube, the video gained over 18 million views. Its soaring popularity has also lead to reports that FIFA has banned Beats headphones from all World Cup stadiums due to FIFA’s partnership with Sony Corp, another great example of a brand outperforming its direct competitors despite not being an official sponsor. When brainstorming new pieces of content, try to pick out unique or less-explored angles. While Beats could have focussed on the game itself, it decided to take a look at how many of us prepare before a match. Remember, successful content marketing strategies can be for everyone. If you’ve been a little sceptical of content marketing in the past, it’s time to get the ball rolling.